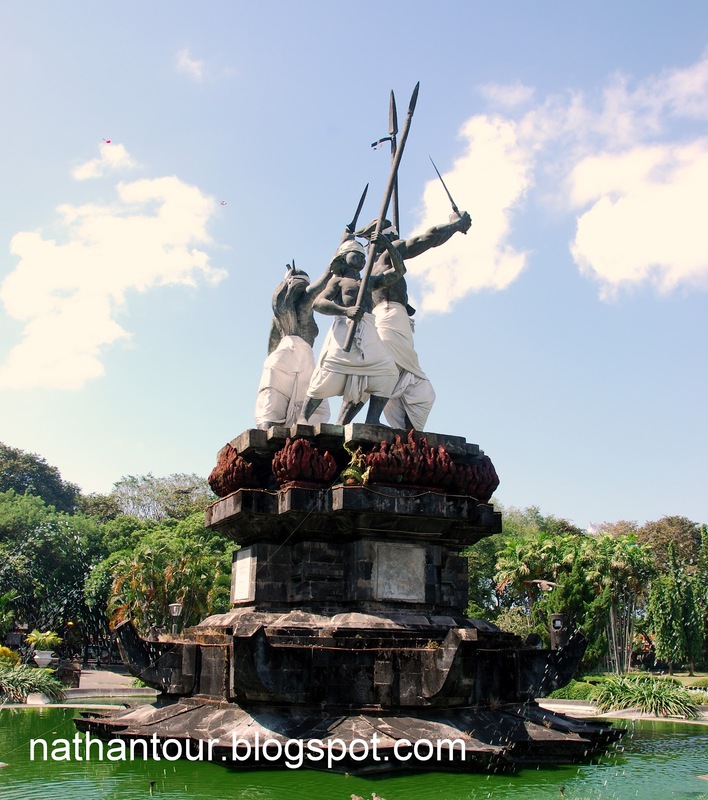 Denpasar City is a capital of Bali Province since 1960 up to now where previously it was a capital of Badung Empire which is controlling the south part region of Bali Island from the end of 18 century until conquered by Dutch in 1906. Denpasar is a place for Bali Governor's office therewith all offices from private sector until important government office like telecommunications, post office, bank, airline and hospital. The word of Denpasar is mean in north of market. It is a fast growing town especially since the tourism industry growth around 1960. Denpasar is populated by 561.814 people. Gajah Mada Street is main road in this town as the shopping centre and the edge of this street, exactly in the middle of crossroad had been built a statue which is called Catur Muka Statue. Caur Muka Statue is a statue owning four faces by observing four directions from north, south, east and west. This statue is made on 1972 and it's building to commemorate the Badung War on 20 September 1906 which is well known as Puputan Badung. The courtyard which is located in the south east of Catur Muka Statue is named Puputan Badung Field where the Badung King with its people had battled until him dead against the Dutch colonist. In north side of Puputan Badung is standing up the office which is called Jaya Sabha that is an official office for Bali's Governor accepts the important guest for having dinner while enjoying the Balinese Culture Show. In eastside of Puputan Badung, it had been built a Hindu temple on 1968 that is called Jagatnatha Temple. This Temple is a public temple to worship Ida Sang Hyang Widhi Wasa / God. Especially each full moon, The Hindu people in Denpasar come to this place in particular at the evening time. In south side of this temple, there is Bali Museum built on 1931 by architect of Curt Grundler. Its architecture is a combination between temple and empire palace. This Museum contains the artistic object collection or artifact from prehistoric era until modern-day. Another place is becoming tourist destination is Puri Pamecutan/Pamecutan Palace. There are lodgings for the tourist accommodations are available in this palace. This palace is rebuilt as according to its geniuses after broken by Dutch soldier on 1906 and in this palace is kept a set famous Gold Gamelan as empire heritage.